On this page we present a variety of print and digital references related to the study, rehabilitation, and preservation of Jewish heritage sites, including site and object databases, project organizations and their methods, and critical studies. Resources in the form of preservation guidelines and best practices suitable for application in western Ukraine are unfortunately rather limited. The old Jewish cemetery in Rohatyn, in winter. Photo © 2019 RJH. Bielawska, A., A. Maksimowska, and A. Sidarovich, editors. 2012. Warsaw: Museum of the History of Polish Jews. Evaluation of cultural landscapes, memory, and identity; cultural history and heritage; and presentation of practical experience by leaders in Jewish heritage conservation and promotion in Central Europe. Also available in Polish, and as a pdf. Murzyn-Kupisz, Monika, and Jacek Purchla, editors. 2009. Kraków, Poland: International Cultural Center. Proceedings of an international conference held in Kraków in 2007 on the intersecting topics of memory, heritage, and the re-vitalization of urban spaces since the fall of Communism. Relates memory and identity, the real and the imaginary, and the dilemmas of rediscovering or reconstructing Jewish heritage where it ceased to exist for decades. Jagodzińska, Katarzyna, and Jacek Purchla, eds. ; International Cultural Center; Kraków, 2015. Meng, Michael; Harvard University Press; Cambridge, 2011. Comparing urban spaces across the east-west “divide” in central Europe, the author considers how broken but surviving Jewish physical heritage, especially where local activists resisted Soviets aims to eliminate memory, forces modern city residents to confront the complex past and gain a more nuanced understanding of their altered world. Dziedziczak, Jan, Monika Krawczyk, Lesław Piszewski, Jarosław Sellin; Fundacja Ochrony Dziedzictwa Żydowskiego; Warszawa, 2017. Published on the 15th anniversary of the Foundation for the Preservation of Jewish Heritage in Poland (FODŻ), the album presents Polish Jewish heritage sites in space and time, and in text and photographs, along with essays by the Polish ministers of foreign affairs and of culture and national heritage, and a pointed perspective on who is responsible for Jewish material heritage. Although the organization and funding sources are different, FODŻ’s twinned efforts in preservation and education are useful examples for our Rohatyn program. In Polish and English. Kadlčík, Piotr, Monika Krawczyk, Ruth Ellen Gruber, Weronika Litwin, Małgorzata Omilanowska; Fundacja Ochrony Dziedzictwa Żydowskiego; Warszawa, 2012. A status report on the 10th anniversary of the Foundation for the Preservation of Jewish Heritage in Poland (FODŻ), the album includes essays on the history of Jewish heritage preservation and the drive to preserve, along with descriptions and photographs of the Foundation’s projects. In Polish and English. Menachemson, Nolan; Avotaynu; Bergenfield, New Jersey, 2007. An encyclopedic but brief overview of Jewish cemeteries, with sections on interpretation of text and symbols on matzevot, a handful of famous cemeteries around the world, an extended list of burial places of famous Jews, and a brief section on cemetery preservation practice. Strangstad, Lynette. Second edition, 2013. Lanham, Maryland, USA: AltaMira Press / AASLH. Documentation, methods, materials, and ethics for graveyard conservation. Somewhat limited application outside the US, the text is nonetheless a model for development of cemetery preservation best practices in other geographies. Webber, Jonathan; photographs by Chris Schwarz and Jason Francisco; Littman Library of Jewish Civilization; second edition; Liverpool, 2018. A catalog of the permanent photographic exhibition of the Galicia Jewish Museum in Kraków. Combining thematic essays and detailed interpretations of the photographs, the book covers not only ruins and sites of massacre but also surviving (even vibrant) heritage as well as commemoration sites and images of Jewish revival. Purchla, Jacek; International Cultural Center; Kraków, 2005. An early text on the role of heritage in forming national identity, and on the tension between static heritage and dynamic political changes, as viewed from the perspective of post-communist Poland. JHE is a communication and information portal with news and guidance on Jewish heritage preservation across Europe. Serves as an exchange between organizations and individuals at all levels. Includes a wealth of past and current information on projects in Ukraine, including news articles on our work in Rohatyngoing back to 2012, as well as resource lists of books and websites categorized by topic and by country. Created to support the objectives of the 2009 Bratislava Statement on preservation of historic European Jewish heritage. Sponsor of a 2013 international seminar and workshop on Managing Jewish Immovable Heritage in Europe, which included a presentation by Marla Raucher Osborn on the connection between genealogy and heritage preservation in Rohatyn. A North American non-profit working to “foster appreciation of the cultural significance of gravestones and burial grounds through their study and preservation.” Publishes an annual journal (“Markers”; past issues are available online) and maintains an online knowledge center on preservation methods. An independent agency of the US government, the commission is chartered to identify, report on, and cooperate with governments in Eastern and Central Europe on the preservation of cemeteries, monuments, and historic buildings that are associated with the heritage of U.S. citizens, particularly endangered properties. The commission is active in Ukraine. The cemetery data from the original research has been transferred to an online database now called the IAJGS International Jewish Cemetery Project; in the section on Ukraine, the Rohatyn old and new Jewish cemeteries plus one of the mass graves are listed. The new site includes instructions for submitting new or updated cemetery information. A US-based Christian non-profit organization working since 2010 in Jewish cemeteries in Poland, The Matzevah Foundation (TMF) puts its three principles into action every year: Remembering, Restoring, Reconciling. TMF partners with Polish Jewish heritage organizations, local volunteers, and volunteers from the US and elsewhere who self-fund their own travel, to clean Jewish cemeteries and restore matzevot, monuments, fences, and the intangible connections between descendant Jews and the current residents of towns where these cemeteries survive. TMF has generously shared their heritage preservation expertise and partnership strategies with us at conferences and in meetings, as well as on-site working with them on their projects. The Magurycz Association is an informal group of stonemasons who have worked for 30 years to preserve stone markers and monuments in disused cemeteries in Poland and neighboring countries; much of their work has focused on the rescue of abandoned cemeteries founded by ethnic groups who were displaced by the Soviets after WWII (including Lemkos and Boykos with ties to the Ukrainian Greek Catholic church). Association members have developed expertise in the conservation of stone art monuments in Central Europe; they engage and train volunteers in new projects each year. Also with an active interest page on facebook. 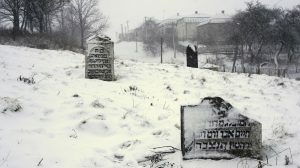 A Lviv-based Jewish heritage organization which has worked in western Ukraine for more than ten years, the Center has successfully registered a number of cemeteries as Ukrainian regional and/or national heritage, and has effectively redirected several building projects which would have encroached on cemeteries. The Center also aims to create and support education programs to broaden understanding of Ukrainian Jewish heritage and history, both in Ukraine and in western countries. Although distinct in its coverage of heritage from some issues particular to east-central Europe, the website and administration of this heritage organization in the United Kingdom are useful models for managing productive cemetery and building preservation programs with very limited staff. Documents a highly-successful public-private synagogues restoration project, now completed. An excellent example of cooperation between a regional Jewish community and museums with the support of local, national, and EU governments. The Center for Jewish Art (CJA), a research institute at the Hebrew University of Jerusalem, studies and documents Jewish visual culture in more than 40 countries. A key outcome of their effort is the visual database named for their founder, the Bezalel Narkiss Index of Jewish Art. Along with household and ritual objects, the database also includes documentation on European Jewish cemeteries, as well as research, architectural drawings, descriptions, and photographs of surviving synagogue and other community buildings (often re-purposed or in disuse). An online map of historic synagogues of Europe provides a geographical search tool to the database. Created and funded as a Germany-based program with field offices in Kyiv in 2015, ESJF works to define, protect, and preserve Jewish cemeteries in central and eastern Europe, through projects which survey the sites and construct cemetery walls with locking gates, along with an initial clearing and cleaning of the cemetery grounds. To date, more than a hundred cemeteries have been fenced, and many more have been surveyed and documented. Partnering with government and NGO organizations, ESJF is also developing efficient methods and materials for site work which respects Halakhic law, scientific approaches, local regulations, and cemetery neighbors. ESJF maintains an online map of its project sites, and an online map of its survey sites. A Polish non-profit organization which records and databases inscriptions read and translated from matzevot in Jewish cemeteries across Poland. Operating informally since 2006 and as a foundation since 2012, the team has developed reliable methods for reading and interpreting Jewish epitaphs in the region’s styles and materials. The database is open and free to the public; a cooperative agreement with JRI-Poland extends visibility of the data to family historians tracing their roots to Polish communities. The register catalogs significant cultural property in Ukraine. Wikipedia has a lengthy description in Ukrainian and a much shorter English description. Wikimedia Commons has images and some descriptions of registered monuments and buildings across Ukraine (in Ukrainian). Photos of heritage monuments in Rohatyn (in English and Ukrainian) are also grouped; many of those photos were submitted by us. Pictured among the Rohatyn monuments are the beit midrash, the Ukrainian and the former Polish gymnasiums, all of the surviving historic churches, the former sokol building, and many of the market square buildings where Jewish families once lived. A website and non-profit organization ‘dedicated to the documentation, preservation and educational dissemination of the history and rich cultural heritage of the Jewish communities of Galicia and Bukovina.’ Encyclopedic in scope, the website combines articles on the Jewish history of the region with databases of heritage sites, some quite detailed. The cemeteries database includes an entry for Rohatyn’s old Jewish cemetery, and a search for members of the Rohatyn Jewish community yields results even out of town, for example this matzevah for a Rohatyn Jew buried in Solotvin. A one-man blog and information website focused on gravestone conservation, with majority examples and techniques applicable to North America but with general methods and some materials useful anywhere. A lengthy, useful glossary of terms plus a FAQ and a page of links to other organizations, suppliers, training, and reference cemeteries. Especially useful are the numerous how-to articles with detailed issues and strategies. The website has not been updated in a couple of years, but the archived info is a helpful reference.